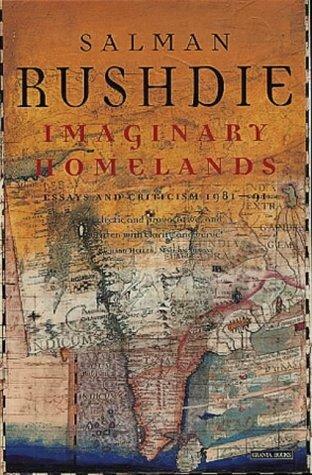 Oh boy, Rushdie can definitely write. I must say that I am biased: Salman Rushdie has been one of my favorite authors ever since I encountered The Satanic Verses. I've always admired a person who would be willing to question everything, and hold nothing sacred. I have followed the whole controversy relatively late, as I was still too young to appreciate the things at stake when the Salman Rushdie affair exploded in the early 1990s. Anyway, I have read about it later, and since I could Rushdie as one of my favorite authors, I tend to get excited when I find my hands on a book of his. Like this one, which is a collection of essays and criticism that were written between 1981 and 1991. He gathers together plenty of essays, grouped into 12 different topics, ranging from politics in South Asia, to authors from various parts of the world, to the Satanic Verses controversy. And perhaps the thing I appreciate the most with this book is that I can see how a brilliant mind like Rushdie's can critique a book. The nice thing about this is that I am rather familiar with several of the authors that he critiques. It also provides me an alternative perspective on things, which is always valuable. For example, he apparently hated Umberto Eco's writings: even though I liked it, I can see why he arrived at a different conclusion than mine. The same can be said on our diverging opinions about George Orwell and Henry Miller. Another thing I liked is that this book provided me with leads on other interesting authors to read. There are authors that I haven't encountered before, such as Italo Calvino, Nuruddin Farah, among others. And reading what Rushdie had to say about these authors made me want to bookmark it for future reading. Anyway, there might be areas where Rushdie and I do not converge, but the important thing is that divergent ideas is okay. This is his main point especially with the Satanic Verses controversy. Censorship is a negative thing: literature is one area where we can entertain diverging ideas in the privacy of our own head. And to explicitly hinder a particular voice when that voice happens to be different from your own is not going to produce positive results. I always see this in the context of cults, after all, I escaped one. If there are things that are too sacred to question, then how do you know that your belief is indeed strong, when you are afraid to put it to the test by looking at opposing theses? Of course I liked this book. I give it 5 out of 5 stars. It's not fiction, but it is recommended reading to get a glimpse into the mind of one of the best writers of our time.